Scoopalicious: What would you do for Toscanini's Ice Cream? 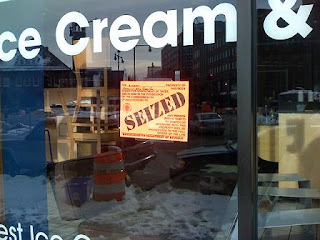 Klondike says "What would you do for a Klondike bar" and Cambridge, MA says "What would you do for Toscanini's" ice cream? Well let's just say many will go above and beyond to make sure this local establishment is around for a very long time. Recently on Forbe's Traveler's list of America's Best Ice Cream, Toscanini's, has a reputation for innovative ice cream (which we are yet to try :( ) but now has an even better rep...ditching the tax man. Uncle Sam came knocking for $168,000 in back taxes, and the scoop shop's loyal fans (Harvard/MIT students, alumni around the world, local regulars and so many more random people) actually answered. They actually banned together to bail the shop out of a payment needed to keep the doors open within one week. Now seriously I love ice cream and all but am I really going to give donations to keep a troubled shop owner out of hot water he created?! These people actually came up with $$34,348.08 for Mr Toscanini to keep his ice cream dream alive. I think I could find better causes to donate my money to but to each their own I guess and Mr Toscanini (actually Mr Rancatore) obviously has built a true following. This now intrigues me even more to try this hotspot so hopefully we'll report back soon. Some of their top flavors...green tea, burnt caramel and khulfee (an Indian flavor with cardamom and pistachio), Vienna Finger Cookie and so much more. Ok so I'm stoaked that people banned together to save Toscanini's but why can't Americans ban together like this (monetarily) for... you know.... like 'causes'? You know like... um... famine? I think i speak for both Tina and I when I say we completely agree, EB. I mean, I love ice cream as much as the next guy (well, duh!) but c'mon...I mean, there are so many other places that need money for sure...!